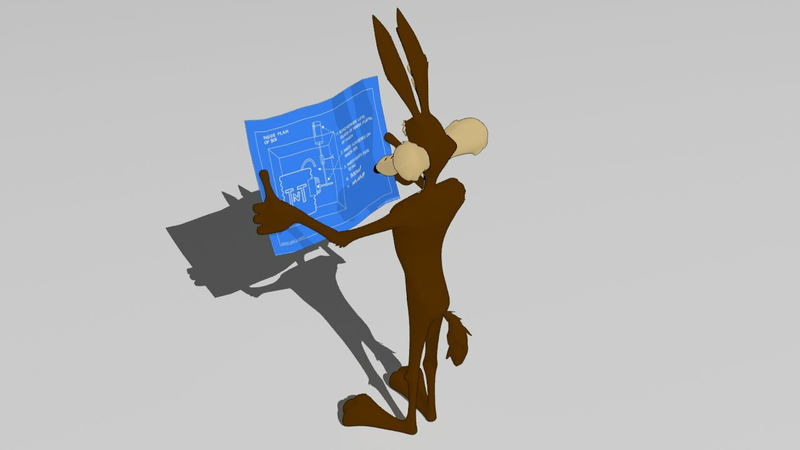 A proposed process for creating the Commission work plan in June. What happens during the special meeting? What happens during the regular meeting? Recommendation: That the HAC discuss, amend, and adopt the work plan format and process described below. Two HAC-specific additions are proposed to the format required by City Council. First, each commission objective in the plan will be associated with specific Lead Commissioners who volunteer to lead the work on that objective. Second, each objective will have an initial associated schedule, describing when intermediate milestones and completion are anticipated. These additional work plan elements will aid the HAC in the coming year. It may be sufficient to simply refer to the duties and jurisdiction we are assigned by ordinance: BMC 19.44.020 -- or, the commission may wish to adopt a more specific mission for fiscal year 2018-2019. A short-hand name for the objective, and a one or two sentence description. A statement of why the commission intends to produce that output: what effects or impacts are hoped for in the short (1-3 years) and long term (4-6 years). A declaration of the specific resources, if any, that are needed to complete the described activity. Note that some resources, such as exceptional contributions of staff time, may require authorization from City Council before the activity can be completed. The descriptions should note such resource requests. Every objective must have one or more lead commissioners who will take responsibility for advancing the proposed project and keeping it on schedule. Any commissioner, up to a total of 4, may volunteer as a co-lead for the objective. The co-leads for each objective shall be considered an ad hoc subcommittee for that specific purpose. They may perform the planned work in that subcommittee, or independently. In the course of the fiscal year leads are expected to involve and consult the full commission and to facilitate all other commissioners who wish to contribute individually to the objective. The leads are responsible for keeping the full commission regularly informed regarding progress on the project. An initial declaration of dates when intermediate milestones and project completion are projected. a one page "executive summary"
A summary of the objectives and associated resource requests (if any). In June, the Commission will hold a 60 minute special meeting to begin work planning. The special meeting will be immediately followed by a regular meeting. At the regular meeting, the first item on the action calendar will be the work plan. Up to approximately 60 additional minutes will be spent completing the work plan. During the special meeting, all proposed objectives will be combined to form a proposed work plan. During round table discussion, that motion may be altered in ways that are described below. At the end of the special meeting, we will have a draft motion for the work plan. During the regular meeting, the work plan motion will be made and hopefully seconded, debated, and voted upon in the usual way. This will be the first action item. After that vote, we will have most of a work plan! To complete the job, we'll then work on a mission statement. A copy of the work plan will be referred to City Council. If the work plan includes resource requests, those requests will be part of the referral to Council. No plan survives its first exposure to reality. In other words, we plan in advance to prepare, but as we execute plans, inevitably, those plans change. The work plan, especially its calendar of milestones, will serve us throughout the fiscal year as a guide to what we planned to do. As priorities change, dates shift, or new objectives emerge, the work plan can be suitably altered so that it always reflects our current best understanding of what we are trying to do. At the end of the fiscal year, the work plan as it started and as it finished will be a tool for helping us evaluate how well we accomplished what we set out to accomplish. In advance of the special meeting, every commissioner or subcommittee with an idea for what to work on next year should write a memo describing that objective. A template is included below for such memos. At the beginning of the special meeting, the work plan motion will simply be the combination of all of those proposed objectives. That is, if someone has written a memo naming some objective, X, then X will initially be part of the proposed work plan. Any commissioner may add themselves as a co-lead to any objective. If more than a quorum of commissioners all want to co-lead a single objective, then two separate teams will be formed, each of which will work on that objective. Any commissioner may remove themselves as a co-lead from any objective. If an objective is left with no leads, it will be removed from the work plan. If all of the leads for an objective agree, the description of that objective may be altered. If all of the leads for two objectives agree, they may be combined into one. If an objective has multiple leads who disagree, the objective can be duplicated, with the leads dividing themselves into two teams. Commissioners are strongly encouraged to write down their proposals in advance of the meeting, and to send them to the Commission Secretary on time for inclusion in the packet. Nevertheless, during the course of discussion, new ideas may appear. There will be very limited time for the creation of new, last minute objectives at the special meeting. These may be introduced by anyone who is also volunteering to be a lead for the new objective. If time runs out before all desired new objectives can be added, don't worry. Remember that the work plan will be a living document and it may be amended at any meeting in the future with the consent of the Commission. Hopefully, after the special meeting, everyone will have signed up to co-lead what they most wish to work on, and will have added what they want to work on to the work plan. Perhaps we will even be so lucky as to have identified objectives that can be combined and, in general, other ways to cooperate so that our individual efforts add up to more than just a sum of parts. It is possible that we will be able to move and pass the work plan very quickly, or, we may wish to have debate and discuss amendments or substitute motions. As the first action item of the evening I will move the work plan constructed during the special meeting. I hope that it will be seconded and voted upon. In contrast with our usual meeting guidelines, in case we have more to discuss, the Commission may spend up to about 60 minutes on the work plan. As the second action item of the evening I will move the mission statement as an action with a blank. The Commission can use the debate period to agree upon a mission statement. Commissioners should think about what they would like to accomplish on the HAC during fiscal year 2018-2019. If you have an idea, especially something you yourself want to work on, write it up as an objective using the template included below. Descriptions do not need to be long: 1-3 pages as a guideline. Be sure to return your proposed objectives to the Commission Secretary in time for inclusion in the packet for the June meeting. After you receive the June agenda packet, look over the objectives others have submitted to see if you have suggestions for them, or can spot ways to combine efforts and cooperate. If you would like to draft a possible mission statement, put a memo with your proposal in the agenda packet. 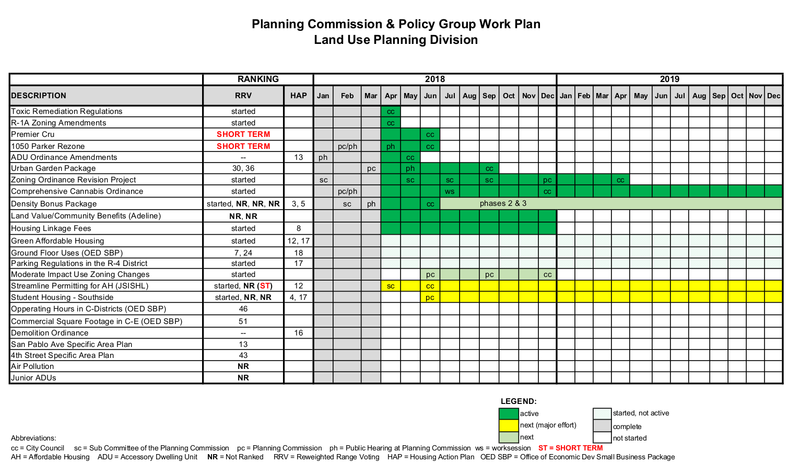 The work plan will include a summary of the proposed schedule in the form of a planning matrix. Here is an example of a planning matrix. This comes from the City of Berkeley's Department of Planning and Development. This example is more complicated than the HAC's will need to be, but it helps to make the idea clear. This is a living document. If you ask the department for a copy of this matrix in a month, it may well have changed. The matrix is a tool the department uses to organize and keep track of what they are doing.